The paratroopers enjoyed more success in Rotterdam and areas near the critical Moerdijk bridges. Dutch troops bitterly contested Dordrecht, another critical target. 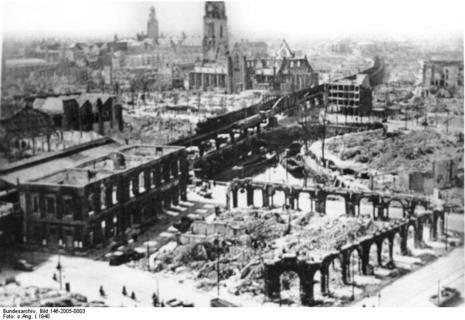 After four days of fighting, the Luftwaffe bombed the center of Rotterdam to break Dutch resistance; at the same time, attempts by the Dutch to link with French troops coming from Belgium failed. The Dutch queen reluctantly evacuated to Britain along with the government, and the Dutch military was forced to cease resistance on 15 May. The situation in Rotterdam on the morning of 13 May 1940 was a stalemate as it had been over the past three days. Dutch garrison forces under Colonel Scharroo held the north bank of the Nieuwe Maas river, which runs through the city, and prevented the Germans from crossing; German forces included airlanding and airborne forces of General Student and newly-arrived ground forces under General Schmidt, based on the 9th Panzer Division and the Leibstandarte Adolf Hitler, a motorized SS regiment. A Dutch counterattack led by a Dutch marine company had failed to recapture the Willemsbrug traffic bridge, the key crossing. Several efforts by the Dutch air force to destroy the bridge also failed. "The resistance capability of the Dutch army has proved to be stronger than expected. Political as well as military reasons demand that this resistance is broken as soon as possible. It is the task of the army to capture the Fortress Holland by committing enough forces from the south, combined with an attack on the east front. In addition to that the air force must, while weakening the forces that up till now have supported the 6th Army, facilitate the rapid fall of the Fortress Holland." Gen. Schmidt had planned a combined assault the next day, 14 May, using tanks of the 9th Panzer supported by flame throwers, SS troops and combat engineers. The airlanding troops were to make an amphibious crossing of the river upstream and then a flank attack through the Kralingen district. The attack was to be preceded by artillery bombardment, while Gen. Schmidt had requested the support of the Luftwaffe in the form of a Gruppe (about 25 aircraft) of Ju-87 Stuka dive-bombers, specifically for a precision raid. Schmidt's request for air support reached Berlin, staff of Luftflotte 2. Instead of precision bombers, Schmidt got carpet bombing by Heinkel He 111 bombers besides a Gruppe of Stuka's focussing on some strategic targets. Schmidt used the threat of destruction of the city to attempt to force Colonel Scharroo to surrender the city without a fight. 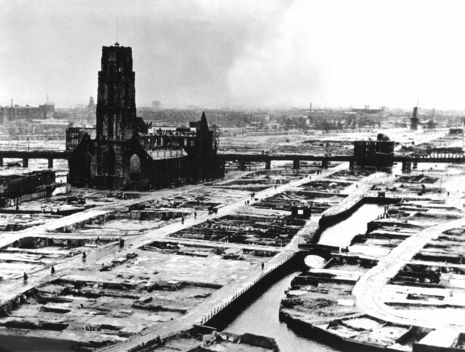 Rotterdam, the largest industrial target in the Netherlands and of major strategic importance to the Germans, was to be bombed. Scharroo refused and stretched out negotiations. The start of the air raid had been set for 13:20 [Dutch time, MET – 1 hr 40]. Schmidt postponed a second ultimatum to 16:20. 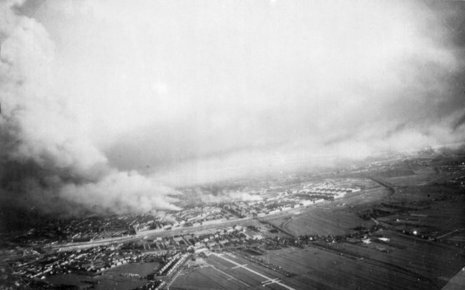 However, just as the Dutch negotiator was crossing the Willemsbrug to relay this information, the drone of bombers was heard: a total of 90 bombers from Kampfgeschwader 54 (54th Bomber Regiment) were sent over the city. Student radioed to postpone the planned attack. When the message reached KG 54's command post, the Kommodore, Oberst Walter Lackner, was already approaching Rotterdam, and his aircraft had reeled-in their long-range aerials. Haze and smoke obscured the target, to ensure that Dutch defences were hit Lackner brought his formation down to 2,300ft (700m). German forces in the city fired flares to warn the bombers off — after 3 planes of the southern formation had already unloaded, the remaining 24 from the southern bomber formation aborted their attack. The larger formation came from the north-east, out of position to spot red flares launched from the south side of the city, and proceeded with their attack. 54 He 111s dropped low to release 97 tonnes (213,848 lbs) of bombs, mostly in the heart of the city. Why the formation had not received the abort order sooner remains controversial. Oberst Lackner of the largest formation claimed that his crews were unable to spot red flares due to bad visibility caused by humidity and dense smoke of burning constructions, and subsequently needed to decrease altitude to a mere 2,000 feet. But the red flare, which Lackner failed to see, might have also been used by the Germans to show their location in the city to avoid friendly fire. An official German form designated red as the colour for that purpose.. In total, 1,150 x 50 kg (110 lb) and 158 x 250 kg (550 lb) bombs were dropped. Many of these hit and ignited homes, churches, stores, warehouses and schools resulting in uncontrollable fires in the city centre. Hooton states that bombs ignited vegetable oil tanks on the dockside, which caused fires that spread into the city centre, causing massive devastation. 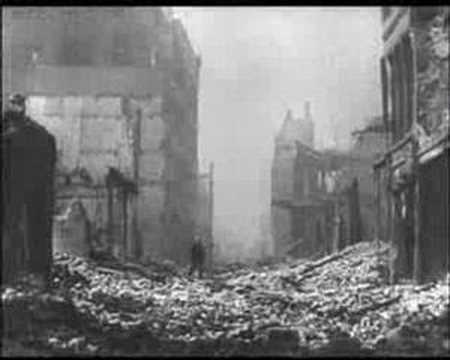 Although exact numbers are not known, 800 to 900 people were killed and 80,000 made homeless. Around 2.6 square kilometres (1 square mile) of the city was almost levelled. 24,978 homes, 24 churches, 2,320 stores, 775 warehouses and 62 schools were destroyed. Schmidt sent a conciliatory message to the Dutch commander, who surrendered shortly afterwards.